Home › Tea Party › What ever happened to the Amero? What ever happened to the Amero? Remember when the dollar was about to be replaced by the Amero? 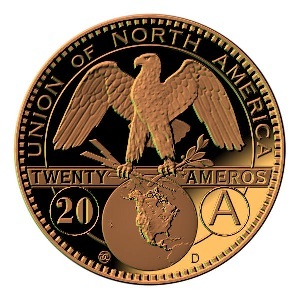 For a couple of years starting around 2005, the secret emergence of the Amero as a unified currency for the US, Canada, and Mexico was one of the top concerns of the far right. According to sources in “the global community,” the US government was negotiating secretly with its neighbors to replace the dollar and, in the process, end US sovereignty with a broad-based North American Union. In case you were skeptical, the email forward which bore this terrifying insight included irrefutable proof – an image of the new one-Amero coin. According to the missive, the US government was buying billions of these things from a Chinese manufacturer in preparation for the New World Order. The concept was debunked fairly early by Snopes, but facts are for liberals. So who believed this crap? Some of the same Tea Party friends and family who have been burying you with Facebook posts about Obama’s lavish vacations were pretty heated up over the Amero. For a while, it was the conspiracy du jour of the right. Back before Jerome Corsi at WND was a birther, he was warning patriots about the Amero. Republican Congressmen Tom Tancredo and Virgil Goode introduced legislation in 2006 aimed at blocking union with Mexico and Canada. Glenn Beck hosted an Amero-enthusiast in the fall of 2007 and the threat of a trans-national currency union remained a steady theme on his chalkboard of doom for several years. Mitt Romney faced Amero questions in town hall meetings. CNBC interviewed a financial analyst who claimed that the Amero should be influencing investment plans. That analyst mentioned that “the Texans” were pretty upset about the Amero. He was right. Amero fever helped kill the only half-decent idea Texas Gov. Rick Perry ever had. Responding to Texas’ growing transportation infrastructure nightmares, Perry proposed a plan to build a network of corridors consisting of toll roads, rail and other infrastructure. The plan suffered from a lot of weaknesses, but absent the hysterical fears of a “North American Union” those weaknesses could have been remedied. So what was the Amero, really? Like almost every issue dredged from the far right fever swamps the Amero controversy was based on a real thing, taken out of context, and embellished by lies. The word itself comes from a paper written by a Canadian professor in 1999. The coins were minted on a lark by a medallion-maker named Daniel Carr. You can still purchase one online. They may still be a more reliable investment than bitcoins. Looking back now, while America groans under the tyrannical, Sharia-based, totalitarian rule of our Kenyan Muslim Overlord, concerns from the last decade seem downright quaint. Back in those days, a white man could still dream of becoming President. Our troops were winning a glorious war in Iraq. Your insurance company still possessed the God-given freedom to cancel your coverage because you got sick. It was a more innocent time. Currency union never happened because it was never more than a far right fantasy. The Amero hysteria took its toll, but no one was ever accountable. In the conservative movement now the only sin is dissent. There are no penalties for being wrong no matter how serious the damage. From Fast and Furious to Benghazi to unskewed polls and the persistent fascination with hyper-inflation, the last few years have brought a plague of idiotic failed predictions and over-hyped scandals that peel back to reveal nothing. Our addiction to the giddy thrill of paranoia has crippled the American right, leaving us incapable of governing. There can be no long term survival for the Republican Party without a willingness to engage difficult problems on the basis of facts. No effort to improve GOP fortunes can deliver results until we confront the conspiracy theorists and hacks scrambling conservative politics. The Amero takes its place among the collection of dumb conspiracy theories that eventually faded away, but it should not be forgotten. Once I witnessed the Tea party movement at near by local flea market. To my surprise it was run by Jews who where coincidentally pushing pro Israel literature and travel guides to Israel. I found this fascinating and kept the literature as proof to myself. Later I find it said that in the beginning of the Tea party was headed by persons such as Ron Paul and that the movement was hijacked. So red herrings like this author states the Amero is, does not surprise me. As the country is waking up via alternative news, we are seeing all kinds of deceptions. Everyone knows something has to be done. Wow, I’d almost forgotten about this. I remember these crazy rumors now. Chris, you have given me a peep into a world of ‘information’ about which I was completely unfamiliar. I thank you for that. I think. WASHINGTON — Sharon Caliendo of Norman, Okla., worked for home state Republican Sens. Tom Coburn and Jim Inhofe. She worked for Republican Gov. Mary Fallin. She worked for Sen. John McCain’s (R-Ariz.) last Senate campaign. But ever since the tea party gained a dominant hold on the GOP agenda, Caliendo has taken both her vote and her small campaign contributions to the Democrats. In 2012, Caliendo began making small donations to the reelection campaign of President Barack Obama. After the election, she gave to the chief political arm of congressional Democrats, the Democratic Congressional Campaign Committee. She has now made more than 13 contributions totaling $376. In the first 10 months of 2013, the DCCC dominated its Republican counterpart in fundraising. It did so in no small part by attracting new donors like Caliendo, frustrated with the Republican-led House of Representatives. But conspiracy theories, paranoia, and fearmongering are good for book sales and ratings. Hence, they will continue.